During the first weekend of October, Oblate lay associates, who share with us the charism of St. Eugene and our apostolate, gathered in the Oblate House in Hünfeld, Germany. The Oblate laity of the Central European Province meet twice a year. 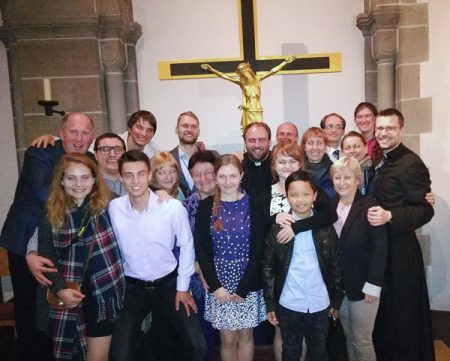 In May, at the so-called “Eugenmeeting”, which usually takes place in various locations in Germany and the Czech Republic, we celebrate the feast of St. Eugene together. It is an informal gathering where we pray, eat, and talk together. There we deepen our sense of various aspects of the Founder’s charism, while learning more about the reality of our communities. The other meeting is usually held in October in Hünfeld, and it is the gathering where they discuss more about themselves, and especially renew their commitment to the Oblate charism. In addition to these two occasions, the individual regional groups, always linked to an Oblate community, organize their own meetings during the year. For this October’s meeting in Hünfeld, we left the Czech Republic in a bus and three other vehicles. We are growing…! In the Czech Republic, there are in fact two groups of members: a group consisting of “the seniors” that is linked to the community of Klokoty, and a group of seven young members linked to the community of Plasy. This time, three of the five new young candidates also went with us. The journey was long but our joy of being together made the time pass quickly. This year there was also a “special guest” with us: Saverio Sapia from Italy, who came to the Czech Republic at the invitation of one of our youth who had participated in a popular mission in Italy last spring. Simply, the Oblate worlds meet. Saverio is a member of the MGC (Italian Oblate youth group). He shared his vocational history (vocation was in fact the main theme of our meeting), and his encounter with the charism of St. Eugene was one of the high points of the gathering. On the way, we stopped to take with us Tom Harke, a young German who studies in Erlangen, almost halfway between Hünfeld and Plasy, and who often came to our meetings in the Czech Republic or to participate in our apostolate. Yes, the oblate worlds meet. Tom was part of the group of four candidates who made their first association at this meeting on Saturday night. The same night, others renewed their commitment. It was certainly a very profound and a touching moment. The members were all in a circle in the sanctuary of the church in Hünfeld, and, one after the other, they pronounced their names promising to live the charism in their daily lives. The new ones received the small Oblate crosses as a sign of belonging to the family. Then it was time for handshakes, hugs, pictures, and of course a beer! Let us not forget that the Central European Province geographically belongs to the world’s superpower in the production and consumption of beer! That wasn’t all… We went on a trip, presented our experience of last year, and elected a new leader at the provincial level. However, above all, the most important idea was, as always, the meeting between us. The family grows and the Oblate worlds meet.